The The Wolfgang Hillen summer school “Nanostructures & Biophysics: Material Science on the Supramolecular Scale” is a two-part summer program of the Center for NanoScience (CeNS) Munich and the International Center for Materials Research (ICMR) at UC Santa Barbara. The first part will take place in Santa Barbara, the second part in Munich. Nanoscience will be taught by an innovative, peer-to-peer training approach and by taking advantage of local expertise and facilities. The scientific aim of this program is to transfer complementary sets of knowledge and skills between PhD students of the participating research groups and to spark new research directions. Leading experts in a wide range of fields will give insights in their latest research on a wide variety of nanomaterials and will provide, together with their students, individual lab projects for the visiting scholars. 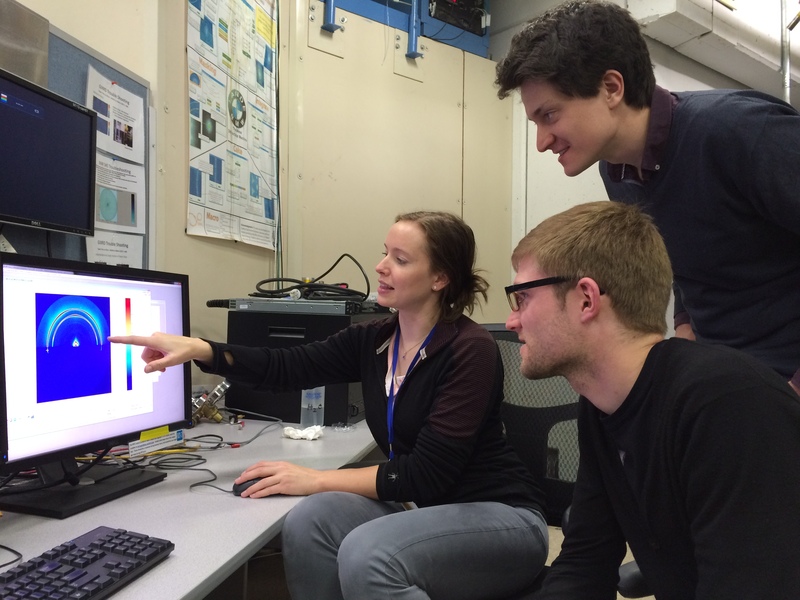 The challenging scientific program will be realized by an unusual teaching concept: First, a group of ten selected PhD students from CeNS will visit CNSI in spring 2015 (May 4-22), where they will be hosted individually by the Californian students. A corresponding student group from CNSI will then visit CeNS in fall 2015 (September 14 – October 2), with switched hosting roles. Each visit will include two weeks of lab rotations and one week of lectures, organised as a thematically focused symposium with invited speakers. During the lab courses, each participating graduate student will present his experimental set-up and own favorite experiment in a two-day course to the visitors. Each student will follow about five different lab courses, thereby guaranteeing the active trading of skills. The students can choose which set-up they would like to know about, such that the final schedule for the students will be tailor-made and teaching can be performed on a very individual basis with small groups of 2-4 students. An additional focus of the program will lie on new ways of implementing effective outreach activities and the democratization of science. The Wolfgang Hillen summer school “Nanostructures & Biophysics: Material Science on the Supramolecular Scale” is a two-part summer program of the Center for NanoScience (CeNS) Munich and the International Center for Materials Research (ICMR) at UC Santa Barbara. The first part took place in Santa Barbara from May 4 to 22, 2015. 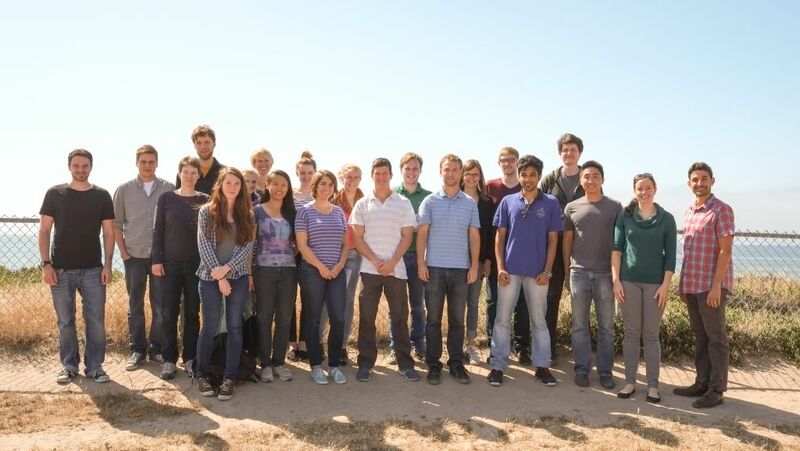 Eleven participants from LMU Munich, TU Munich, the University of Augsburg and the Max Planck Institute of Biochemistry enjoyed a challenging scientific program and the hospitality of their Californian hosts. One central part of the stay in Santa Barbara was dedicated to laboratory work. During two weeks, the visiting students could choose between various modules that were organized and taught by the UCSB students. The tutorials were focused on hands-on work so that the guest students could fabricate and measure their own samples, extend their technical skills and get to know laboratory routines. The two days projects also provided plenty of time for detailed discussions about fabrication and measurement techniques as well as the interpretation of the obtained results. 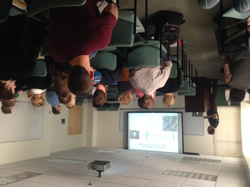 This way the students gained insight to a big variety of methods that are applied in all different areas of nanoscience. In addition to the hands-on modules, the students, UCSB faculty as well as invited speakers (e.g., Paul Rothemund/Cal Tec, Gerard Wong/UCLA, Tim Liedl/LMU) presented their research during a 4-day symposium. One session was dedicated to new ways of implementing effective outreach activities and the democratization of science. Besides sharing the common interest for science, the students connected very well on the personal level from the first day on and spent most of their free time together engaging in various activities – a wine tasting trip to Santa Ynez valley, hiking in the beautiful Channel Islands National Park, and an exciting weekend trip to San Diego are unforgettable. During the second part of the Wolfgang Hillen Summer School (September 14 – October 2, 2015) eleven PhD students from the UCSB visited CeNS in Munich. After a Bavarian welcome breakfast on their first day, the students immediately started with the lab rotations: small groups of two Californian students visited their German hosts and performed hands-on experiments in the labs on topics such as inelastic light scattering on 2D semiconductor materials, DNA origami scaffold preparation, surface mediated synthesis of 2D organic networks, and much more. 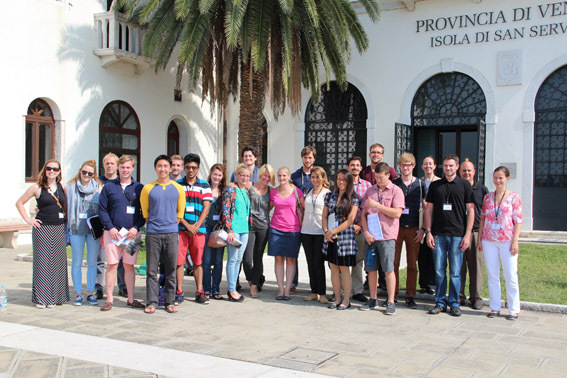 The second week brought another highlight of the program: All students took part in the CeNS workshop “Channels and Bridges to the Nanoworld” at Venice International University on the beautiful island of San Servolo. About 130 participants gathered to listen to 28 top-notch speakers representing the whole diversity of nanoscience research. The students presented their projects in two poster sessions. In addition, there was ample opportunity for discussions with speakers and other participants during lunch and coffee breaks in a charming Mediterranean atmosphere. After their return to Munich, the students continued with their second week of lab rotations and used the opportunity to learn about very different topics at LMU physics department, TUM physics department, the Max Planck Institute for Biochemistry, the Deutsches Museum or the University of Augsburg. In addition, excursions to the Center for Virtual Reality at the Leibniz Rechenzentrum, the Research Neutron Source in Garching and the physics department at the University of Augsburg complemented the program. Beside the scientific program, the Californian students also enjoyed two barbecues with CeNS PhD students and PIs, the vivid atmosphere of the Oktoberfest, a hiking weekend in the Alps and a dinner in a typical Bavarian restaurant. Strong ties between German and Californian students were established not only by these educational and social activities but also by the unusual housing concepts, since private accommodation for all guests was provided by the host students. The 2015 Wolfgang Hillen Summer School was a true scientific as well as social success for all participants and will certainly contribute to deepen existing collaborations and to establish new co-operations between CeNS Munich and UC Santa Barbara.